Invasive lobular breast cancer is the second most common type of breast cancer. Despite its indolent nature, a subset of patients will go on to develop distant metastases. The ACA team is creating one of the largest respository of fresh primary tissue, distant metastatic tissue (bone and visceral organs) and blood from invasive lobular patients to look at microRNA expression patterns in the breast and blood that may predict for future metastasis. Out hope is that one day we will be able to give patients diagnosed with invasive lobular cancer their true risk of future metastasis so that they can decide on potential treatments. A. Ottawa Hospital Rapid Diagnosis and Support Program, which has a goal of reducing wait times diagnosis and treatment for patients with a high probability of breast cancer. This program has reduced the breast cancer diagnosis wait time from 5 weeks to 7 days and has been features on CTV news and the Ottawa Citizen. 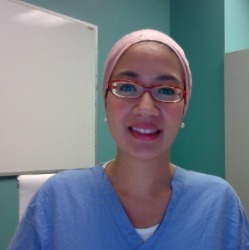 In November 2013, she won the “Best Innovation in Cancer Care Delivery Award” at the Ontario Provincial Showcase. B. The Advanced Multidisciplinary Program, which brings specialists of 10 disciplines simultaneously together to treat patients with advanced breast cancer, with a goal of providing multidisciplinary cancer care in a timely fashion. In addition, she has recently been awarded peer-reviewed funding to perform a novel 3D study to determine the most precise procedure to assess cancer removal after surgery, which could mean less chance of recurrence, fewer repeat surgeries and less stress on patients. Dr. Arnaout proposes the world’s first clinical trial ("SMART Trial") to compare commonly used breast tissue assessment techniques, with goal is to identify the most accurate and objective method for breast cancer tissue assessment to formulate best practices for the medical community worldwide.